MOSCOW, April 16. /TASS/. Russia’s President Vladimir Putin has offered to provide French President Emmanuel Macron with the best Russian specialists to assist in rebuilding the Notre Dame Cathedral in Paris and conveyed his condolences over the blaze that devastated France’s national symbol, the Kremlin press office reported on Tuesday. "Notre Dame is France’s historical symbol, an invaluable treasure of European and world culture, and one of Christianity’s most important shrines," Putin stressed in his telegram. "The catastrophe that occurred in Paris last night has pained the hearts of Russians," the telegram reads. "Putin hopes that it will be possible to rebuild the cathedral and offered to send the best Russian specialists with wide-ranging experience in restoring world cultural heritage monuments, including the works of medieval architecture, to France," the Kremlin press office said. 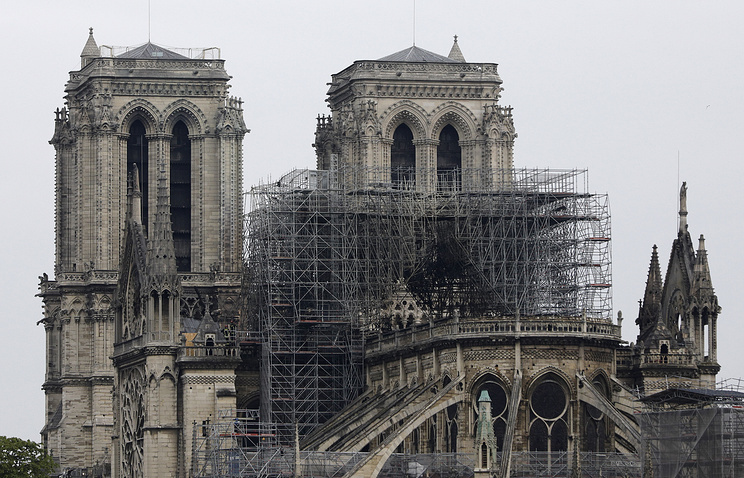 France’s world-renowned Notre Dame de Paris caught fire at about 6:50 p.m. local time on Monday. The upper part of the cathedral’s spire, its clock and most of its roof collapsed in the blaze. According to preliminary information, the inferno ignited during repair works at the cathedral’s upper levels. Notre Dame has been a landmark site in the French capital for centuries. It is on the list of world historical monuments. In August 1239, one of Christianity’s most sacred relics, Jesus Christ’s Crown of Thorns, was brought to the cathedral. Luckily, it survived last night’s fire that partially destroyed the cathedral where it was housed. Notre Dame is the site where the States General (or Estates General, the first French parliament) was convened and where King of Navarre Henry IV and Marguerite of Valois held their wedding. In 1804, Napoleon was crowned emperor in the cathedral and in 1944, a solemn prayer service was held on its premises to celebrate the liberation of Paris from Nazi occupation. For all travelers, the Notre Dame cathedral whose first foundation stone was laid in 1163 under Louis VII, remains a major starting point. The cathedral’s square gives rise to all measurements of distances in France. In 2013, the cathedral marked its 850th anniversary.